One thing is abundantly clear when it comes to whisky: there’s no such thing as right or wrong. Personal preference and individual choice are so very important in deciding what suits you and your taste. Interesting is a wholly inadequate way of describing this tasting. It challenged a lot of preconceived notions and produced a worthy result, but deciding on a favourite wasn’t easy for any of the tasters! Guest tasters were Bernard Gutman and Andrew Chirauka, an enthusiastic member of the Cape Grace’s Bascule Bar team. Lined up before everyone were three 12 year old malts – Cragganmore, The Macallan and Glen Grant – a very special Glenfiddich 19 year old, a Glenbrynth 40 year old and finally the idiosyncratic Bruichladdich Rocks, an unpeated whisky which was bottled at 46% alcohol by volume rather than the more common 43% for the South African market and drinks laws. Cragganmore is now part of the Diageo stable. It’s located near the town of Ballindalloch in the Highlands of Scotland and is quite unique in that its spirit still not only has a flat top but is also quite short. Bernard Gutman is a fan of this whisky and was surprised by what he’d written when the order was revealed after everyone had finished tasting. It’s a bit lighter than I’m used to and I know this whisky well. I’d be interested to find out if anything has changed with this Classic Malt. 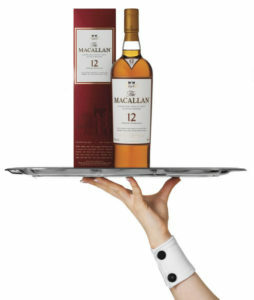 The Macallan was tasted next and tasting panel chairman Dave Hughes said if it was at all possible he found it almost too perfect: it’s just ideal – the fruit, the wood maturity, good balance – everything’s there! By contrast, the Grant’s 12 year old offered more sweet vanilla and toffee with a slight dryness noted by the tasters who almost unanimously loved it – but it had ample character and interest. 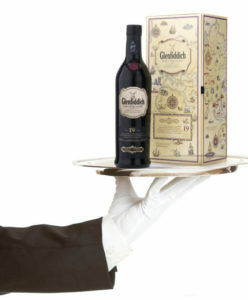 Up fourth was the Glenfiddich – and it was spectacular. A very, very special whisky with complexity, citrus fruits, distinct sherry character and even a black pepper spiciness to it. It’s a triumph of the blender’s art. 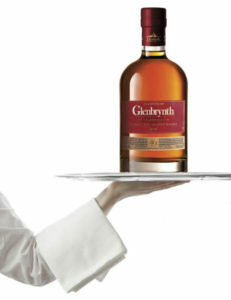 The Glenbrynth provoked a lot of discussion about ageing of whisky – and whether an older whisky is necessarily a better one. So much about appreciation of the spirit is personal – and taste preference differs from person to person. There are people out there who are going to be seriously impressed by this whisky, Hughes said. The final dram also got everyone talking – simply because it was so very different. Bruichladdich is known for its extensive range and numerous bottlings and this is probably one of the most quirky and idiosyncratic of a pretty unusual range! It is billed as having been blended for enjoyment on the rocks and it must be said that we did not taste this dram on ice. We’ve got to leave something for readers to experience themselves! Deep gold. Powerful and complex nose with wide array of aromatics yet with delicate floral notes. Fresh stone fruit with hints of rum and maple on a light, herbal backing. After the full nose the entry into the mouth is relatively light yet firm. On dilution the flavours spread rapidly across the palate with a complex mix of stone fruits, tropical fruits and light herbal character. Smooth yet firmly textured. Long finish where the herbal characters dominate with a delicate floral backing. Restrained and delicate throughout but very pleasing. Novices: Andrew concurred with the dried fruits and found a light smoky note while Bernard liked the balance and lightness. Pale gold with delicate, pink tinge. Fresh, vibrant nose with sea shore notes, ripe apple and sweet malt. Bonfire backing also apparent. Light malty flavours mingle with hints of red berry and saline notes in the mouth. It is crisp and lively too. Very unusual but grows on you! Pale amber. Delightfully attractive nose packed with textbook honey, heather and sherry with floral backing. Perfect, smooth entry with full flow across the palate giving complex array of flavours of apple, cinnamon, nuts, oak and range of citrus flavours. Barley and vanilla come into play too. Almost perfect in everyway and great expression of a 12 year old. Long, sustained finish. A faultless whisky. Novices: “A standout,” Shayne declared. “It opened up so much on dilution – just absolutely wonderful. I want some more!” Fiona noted the light autumn leaf crunch to the palate. Pale, old gold. Gentle nose with abundance of sweet spice and toasty backing. Strong vanilla and cinnamon develop with time in the glass. Hints of black pepper and fudge. Juicy and supple in the mouth with finest texture. Great delivery of complex flavours where burnt orange, caramel and fudge are very evident. Hints of Cape gooseberry enrich the citrus characters. Intense yet incredibly soft and rounded. Everlasting finish. Novices: “Fantastic!,” said Bernard. “Lots of waxy citrus rind – more than I’d expect to be apparent in a 19-year-old.” Andrew likened its texture to that of liquid chocolate: melting and delicious with a touch of spice adding interest. Rich, full nose with lots of mature notes well balanced by fresh fruit. Caramel and toffee fill in the background. Rich, full flow into the mouth with smooth, mellow feel and great texture. Vanilla and spice show well along with sherry and good oak. Silky flow with just the slightest hint of smoke. Malt and honey add to sweet sensation yet, gorgeous, long, dry finish. Very rewarding drink. Novices: “So appealing and silky in texture with delicious vanilla, butter toffee, biscuit and shortbread,” said Fiona. Complexity and balance were the watchwords for Bernard while Andrew liked its accessibility and ease of drinking. “Very smooth,” he said. Pale gold. Nose packed with oak and old leather. Hints of pipe tobacco and dried apricot. Loads of mature characters in the mouth with velvet smoothness all on a soft, oaky backing. Hints of ripe fruit with some vanilla at the edges. Almost tannic leading into a dry, fading finish. Novices: Shayne likened this to walking in a forest glade. “It’s almost green and woodsy on the nose which I find really interesting.” Rich caramel is what Fiona found on the finish – and likened it to cracking the crispy top of a crème brulee dessert. 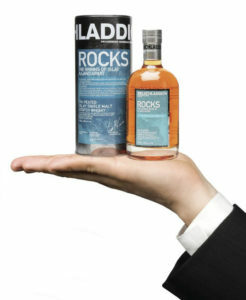 Dave: (Left) Whisky must have character – whether it’s from fruit, wood or texture. Bernard: (Middle) A paralegal-slash-consultant, he co-founded the Cigar Club of SA and also lectured at the College of Whisky. Andrew: (Right) Andrew Chirauka is part of the Bascule Bar’s vibrant team. “Wow!” is all he had to say about his love of whisky and he absorbs knowledge about it like a sponge.